Growing nutrient-rich sprouts is easy with this smartly-designed home sprouting jar. 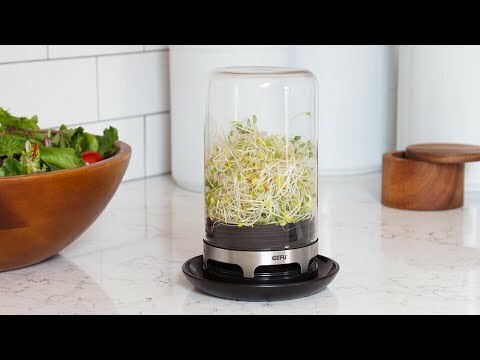 Like a mini greenhouse, it creates the perfect climate to grow little seeds into fibrous alfalfa, lentils, radishes, and any other edible sprouts. Its integrated strainer and base help drain water and eliminate the most common problem with home sprouting: mold. Great for sprouting seeds such as alfalfa, mung beans, radishes, chickpeas, wheat, lentils, etc. Easy to clean, easy to use - it's what I needed to get started sprouting again. I use the sprouter a lot. works great. You don’t have to be a pro to get behind this home sprouting jar—beginners and experienced sprouters alike will appreciate it. The design creates climate-perfect, mess-free conditions to grow alfalfa, lentils, radishes, and any other edible seeds. Bivita was engineered to guide you through the process and eliminate the most common problem with DIY sprouting: mold. Its base has integrated ventilation and a steel mesh strainer that lifts your seeds above the water catch-all to keep the environment just right. You may be wondering “What’s so special about sprouts?” Well, before a seed can sprout, it creates all the vitamins, minerals, and beneficial enzymes it needs to survive. They’re at this nutrient-rich sweet spot. As the plant enters a more mature stage of growth, those vitamins start to diminish. Creating your sprouts is simple. Place seeds, grains, or beans in the overturned dome with water, swish, then turn the dome over so what’s inside will drain. Repeat the swish-and-turn each morning and night for the next 3-4 days. And, boom. You’ll have yummy, fibrous sprouts to top off your salads and sandwiches. Hone your sprouting skills and give your body a little nutrient boost with this smartly designed mini green house.